For all the benefits that Sky Q offers, like 12 or so tuners. 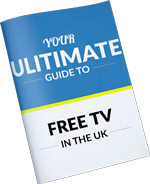 One of the main downsides is that if you’re upgrading to Sky Q from a standard Sky subscription with only a single cable connected. The Q service will not work with a standard Sky installation with a wideband LNB. The obvious way around this would and most cost effective be to install a second cable from your satellite dish, or replace your existing cable with a twin cable. There are however situations where this isn’t always feasible. Like in properties where cables are routed under floors, within the walls etc and you don’t want to be chipping away at walls or leaving loose cables trailed around or tacked to skirting boards etc. Fear not I have solutions for you! Why Does Sky Q Need Two Cables? It helps to understand why your Sky Q box is not designed to work with a single cable. The first Sky boxes could be operated fine with a single cable and a second cable only become required with Sky+ and Sky+HD which allowed you to pause and rewind the TV and schedule and store recordings to an internal hard disk drive. For this extra feature you needed a second feed. I won’t into it much more here but I discuss in greater detail on my Youtube Video “What’s New With The Sky Q LNB?" That being said the Sky+ would still work fine with one cable and the Sky box set to single feed mode, you just wouldn’t be able to record one programme and watch another. This isn’t the case with the Sky Q box as it needs two satellite cables connected to a wideband LNB. This is because the two signals are not identical like with Sky+ and Freesat+. With Sky Q one cable provides the vertical polarised signals and the other provides the horizontal signals, with one cable you will only get half of the services. But like I already said it is possible to Sky Q on one cable with no loss of services using dSCR technology. When you have an upgrade to Sky Q the Sky installer or indepdent satellite engineer will change your own quad LNB to a wideband LNB. Instead of doing this a dSCR LNB could be installed instead. There are a few models available but some have separate legacy outputs that will allow you to connect extra standard Sky or Freesat boxes. When you have the Sky Q box connected to the dSCR output on the LNB with a single cable. You need to set the Q box to single feed mode as described at the bottom of the blog. If you live in a block connected to a communal TV system the work will need to be completed to get the Sky Q service to work. There are a couple of options here but I recommend reading my blog on how to upgrade communal TV systems for Sky Q and a more detailed answer. To upgrade a complete system to Sky Q can cost a fair amount of money and depending on your arrangements with other residents/ managing agents/ landlord it may be difficult to get everyone to agree to the price so you may want to add an dSCR adapter to your system to which you connect four cables from the existing multi-switch amplifier and then connect the cable which feeds your flat. Don’t worry if there are not enough spare outputs on the multi-switch as other residents cables can be connected to the legacy outputs on the dSCR that has been installed. It can be tricky to find the cable that feeds your flat among all the other flats so you will be best to contact a professional satellite installer to help you with this. In any case your going to need permission to work on the communal TV system from whoever owns or manages it. I do not recommend playing around with the cables if you haven’t before as there is a chance that you could leave the system not working at all. To upgrade the whole communal system so that Sky Q can be operated on single feed mode, the existing multi-switch amplifiers will need to be upgraded for dSCR amplifiers. 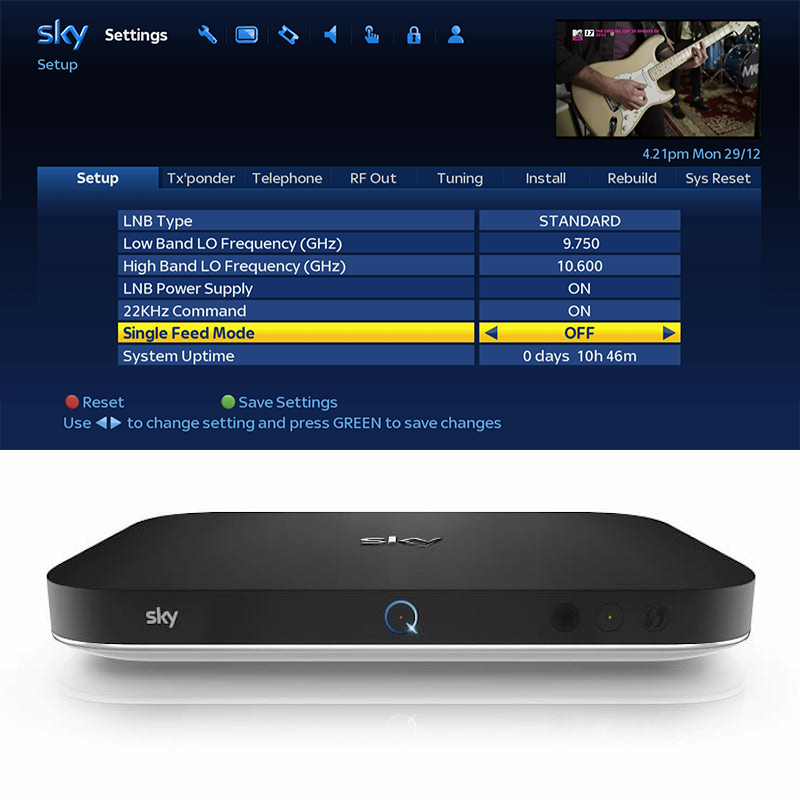 These allow either legacy Sky or Sky Q to be connected on the outputs and the switch between the two is done on the Sky Q receiver by selecting single feed mode within the settings. When the multi-switch amplifier detects the dSCR signal request it will switch to that,this is usually indicated on the multi-switch itself by a blinking LED on the output that is connected to your Sky Q box. To select the dSCR settings that will allow a compatible LNB or multi-switch amplifier please follow this process. 1- Connect single satellite coaxial cable. 4- Access the hidden installer menu by pressing, 0,0, 1 then ‘Select’. 5- On installer menu, scroll across to ‘Installer Menu’. 6- Change LNB type to ‘SCR’ and click save. 7- Finish process by performing hard reboot/ power cycle. Disconnect power and power back up after 2 minutes. Once the box is ready to switched on again, power it backup. If the process has been successful your Sky Q service should be working as normal. That's it! If you have any questions about this process or any other TV aerial, satellite, AV or telecommunications question please DO NOT CALL OUR TELEPHONE LINES or E-MAIL. Please instead LEAVE A COMMENT in the blog comment section below so that everyone reading can get the benefit of the question asked and the answer given.